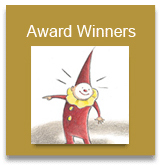 We are pleased to announce the winners of the Gelett Burgess Award for outstanding family-friendly books. Here you will find a complete schedule and submission information. We are proud of the books we select each year, & are pleased to present additional activities & lesson plans provided by publishers. The Gelett Burgess Center believes children deserve the very best resources available, even though finding them can be somewhat of a challenge. Our advisory council spends the year reviewing children’s books from self-published, independent, and mainstream publishing companies in an effort to find the best family-friendly, creative and educational books on the market. The prestigious Gelett Burgess Children's Book Award highlights excellence in family-friendly books covering the broad expanse of a child's existence, helping them grow: socially, emotionally, ethically, intellectually, and physically. This list is promoted throughout the year to parents, educators, librarians, and youth service workers in the United States. The Gelett Burgess Center recognizes Gelett Burgess' disctinct style in both writing and illustration, and holds this standard to the books and scholarship applicants we award. Learn more about the Center by viewing our expanded mission statement here. The Gelett Burgess Center advisory council members want to know a book will make an impact in a child's life by helping them grow: socially, emotionally, ethically, intellectually, and physically. If you think your books meets this set of criteria, submit your book for the Gelett Burgess Children's Book Award.